Coverage of Ms. Hyon has not always been so fawning. Several years ago, South Korean media were rife with speculation that she had been machine-gunned to death at the orders of the North Korean leader, Kim Jong-un, who was rumored to be her ex-lover. 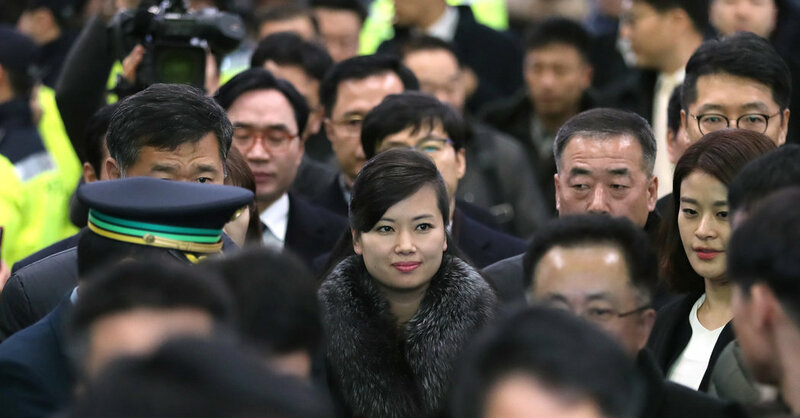 Dressed in a black coat and a fur neck wrap, Ms. Hyon looked stiffly at the crowd but later flashed thin smiles as South Korean officials whisked her onto a bullet train to Gangneung, an Olympic venue on the east coast where Ms. Hyon’s art troupe is scheduled to perform during the Games. At the station in Gangneung, a crowd of townspeople turned out, clapping as the North Koreans emerged from the train. After an overnight stay, the North Koreans will return to Seoul on Monday to inspect a concert hall there where her troupe will have another performance. On Feb. 1, the North’s official Olympic delegation, including 22 athletes, will travel the same inter-Korean highway to take part in the Games, a move that many South Koreans welcomed for reducing tensions during the events. Hundreds of North Korean officials, cheerleaders and taekwondo demonstrators will follow suit later. The Winter Games begin in Pyeongchang on Feb. 9. North and South Korea agreed to the North’s participation in a series of border talks during the past couple weeks, which raised hopes for a political thaw. The highway, built to connect Seoul to an industrial park in the North Korean city of Kaesong, was closed in early 2016, when the South shut down the park in response to the North’s nuclear weapons program and other provocations. President Moon Jae-in of South Korea, who took office in May, has advocated dialogue, and seized upon the North’s Olympic participation as an opportunity to ease tensions and promote negotiations. However, his conservative critics warn that the North is just trying to use the Olympics to undermine international resolve to enforce sanctions against the increasingly isolated country. On Saturday, the International Olympic Committee announced that although North Korea had missed the deadline for accepting an Olympic invitation, 22 of its athletes would be allowed to take part as wild-card entries. The two Koreas have also agreed to march together in the opening ceremony and to form a unified women’s ice hockey team, the first inter-Korean team ever fielded at the Olympics. But Ms. Hyon’s troupe, made up of young North Korean women known for their beauty, is expected to steal the Olympic show among South Koreans, many of whom detest the North Korean regime but feel ethnic affinity for their northern neighbors. Ms. Hyon, who holds the rank of colonel in the North Korean army, leads the Moranbong Band, said to be a favorite of the North’s leader, Mr. Kim. Under Mr. Kim’s rule, the band has modernized the North’s propaganda music scene by wearing short skirts and performing American pop standards like “My Way” and the “Rocky” theme song. South Korean officials have wanted to ensure that Ms. Hyon’s artists keep political propaganda out of their performances in the South. North Korea has already suggested that unlike the athletes, Ms. Hyon’s troupe will travel through Panmunjom, a border village where the truce halting the Korean War was signed in 1953. In November, a North Korean soldier dashed across Panmunjom through a hail of bullets from fellow Communist troops to defect to the South. By sending the performers across Panmunjom less than three months after the soldier’s defection, Mr. Kim wanted to punctuate the dramatic shift in mood between the two Koreas, analysts said. Also on Sunday, North Korea agreed to let an advance team of South Korean officials visit ski and tourist resorts on its eastern coast for three days beginning Tuesday, South Korean officials said. The South Korean delegation will inspect sites where the two Koreas agreed to launch a pre-Olympic cultural event and also train their skiers together. The South Korean officials will travel via another closed highway that once linked the divided peninsula. The highway was used to take South Korean tourists to the North’s scenic Mount Kumgang until the program was shut down following the 2008 killing of a South Korean tourist by North Korean soldiers. North Korea has insisted that the South reopen the Kaesong industrial complex and the Mount Kumgang tourism program, both of which had been important sources of cash for its regime. But Mr. Moon said that it would be difficult to reopen them unless the North moved toward denuclearization.